Below are the complete details of the Security Guard jobs in Al Kamil Enterprises Overseas Employment Promoters in Rawalpindi. Skills Required for Job: Candidates must have Good Communication Skills. Good Team Working Skills. A good security guard is always alert and aware of his surroundings. A good security guard must be honest. He should be within a healthy weight range and exercise regularly. Good Communication Skills. Ability to Serve Client's Needs. Qualification: Security Guard Jobs In UAE. Required qualification: Matric Pass/ FA from Recognized Board/ Institution. Attractive Salary Package. 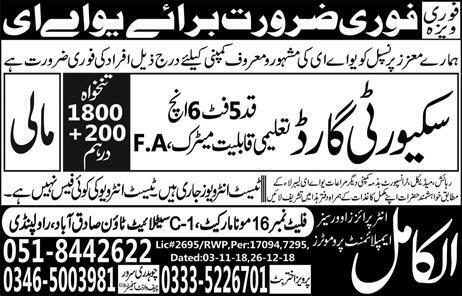 Security Guard jobs in Al Kamil Enterprises Overseas Employment Promoters Rawalpindi, in Pakistan published on Paperpk.com from newspaper on January 08,2019. 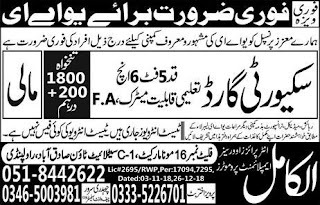 Job seekers who are already working as Security Guard , Security Officer , SSG Guards , Male Security Guard can also apply for post of Security Guard.